The BBC follow-up to 'Planet Earth,' 'Life,' and 'Human Planet' is bound for Blu-ray in April. In an early announcement to retailers, BBC/Warner will be releasing 'Frozen Planet on the high-definition format on April 17. From BBC Earth and Alastair Fothergill, Executive Producer of 'Planet Earth' and 'The Blue Planet: Seas of Life,' 'Frozen Planet' is the epic tale of two disappearing wildernesses. The Arctic and Antarctic remain the greatest wildernesses on Earth. The scale and beauty of the scenery and the sheer power of the elements – the weather, the rough ocean and the ice – is unmatched anywhere else on our planet. Many of the most spectacular landscapes, charismatic animals and their behavior have never been recorded before. Filmed with the same breathtaking camera techniques as 'Planet Earth' and 'Life,' 'Frozen Planet' tells the compelling story of animals such as the wandering albatross, the adelie penguin and the polar bear, and paints a portrait that will take your breath away, at a moment when, melting fast, the frozen regions of our planet may soon be changed forever. 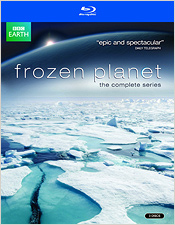 The 3-disc set will include all seven episodes with a DTS-HD Master Audio 5.1 soundtrack and supplements include Science at the Ends of the Earth documentary, On Thin Ice featurette, and six Freeze Frame Video Diaries. Suggested list price for the Blu-ray is $54.98. You can find the latest specs for 'Frozen Planet' linked from our Blu-ray Release Schedule, where it's indexed under April 17.